Ive had my Ping i 3 s for about 8 years now, they have been great clubs for me chosen by my son who is a pro and also has a set. I think they will last for ever. I would recommend them to any one who is a mid handicap and wants a great second hand buy. Thanks Ping you did me proud. 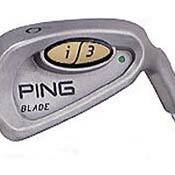 Had my Ping i3 Blades from new 16 years ago, a thing of Beaty they still compare with anything on the market today, tried other irons but nothing comes close. The distance control I get is fantastic even on miss hits, when you only play once a week they are so solid,forgiving and a great sound, still look brand new. Awesome set of irons, great feel and player friendly. I wouldn't use or hit any other clubs. They fit my game perfect. I play to a 3 handicap at 67 years young. The pingi3's are the best irons I have ever struck.I love the feel of a ball off them and I know instantly when I mis hit them. Ping legendary. Used the serial number on the hosel and ordered a 2-iron. Matched perfectly in feel, etc. I bought a used set of Ping i3 irons at the DuPage Golf show for only $150,PW-3 in great shape. Really lucked out. Brought them to my Golf Galaxy to get fitted and not only are they a 1/2 longer in the shaft ( I'm 6'3") but when they put the tape on to see where I hit them, the black dot is right on. They look good and perform a bit better than my old clubs. My swing has been improving and scrores have been dropping. The feel of these clubs just gets better. I like their look. They sure look cavity backed to me. Was worried they weren't the Oversized and feared losing forgiveness which I need from time to time. My blades, when held up against the Oversized clubs, the lack of club head is on the top, not a place I miss much so I felt better. Very happy with these and pretty much stopped looking around. I bought these clubs as a 12 year old eighth grader one year into my golfing career. I typically shot in the low 100s to high 90s, hitting my irons very poorly. Once I got my i3 blades, my game started rapidly improving. Within my first year of playing these clubs, I dropped about 10 strokes off my score. They are forgiving enough to accommodate players of all abilities while still being able to satisfy the demands of low-handicappers. The better I got, the more I began to love the clubs. Now, as a 17 year old high school senior, I am a 1 handicap. I've had these clubs for 5 years and just bought a brand new set of Adams mb2s. These clubs are legitimate blades and I've found them to play extremely similar. Anyone who says that ping i3 blades are cavity backs has no idea what they're talking about. I bought these clubs from a military buddy just before I retired. He was tall like me and used green dots with 1" over Rifle 6.0 shafts, which I cut down 1/2" and regripped with Lamkin Crossline Jumbos. These were a mixed set, with 3-7 being the i3 O-Size and the remaining 8-LW being the i3 Blade. This was the best bag I've ever had, and I regret no longer having them. The "Blades" (go figure-cast stainless cavity-backs) have enough offset to be forgiving but you can still easily work the ball. You won't have the true forged feel, but there is still some feedback. I love the wedges, too. The O-Size long clubs, a smidgen larger and more offset, are a joy to hit and extremely forgiving. Oddly enough, I found I could fairly well work the ball with the O-Size, despite the larger offset and slightly larger head size. Someday, I hope to pick up a set of these again, though I think I'll try 3-LW Blades vice the O-Size long iron mix. A coupe years ago I donated these irons to a tall kid on the local HS Golf Team. In retrospect, I can't think of a better set to grow one's game with. Bought a new set of custom Warrior forged irons a year ago November with graphite shafts. Performed well when hit properly but my hc suffered and jumped from a 4 to 8-9. Had knee replacement 12/15/09 and while rehabbing bought a used set of I3 blades, and with moderation, have hit 5 buckets on the range. They pass all expectations. They are longer, straighter and more responsive than any club I have owned in 50 years of play. I have used many good sets of irons over the years. These might be my favourite. When I have used Pings before, I have always had Black Dots. I checked, and I am actually a Blue on the old scale. A small change, but I hit the ball more consistently straight with these than usual. The reduced offset on this particular set makes them the easiest Pings to aim (except for the S59 et al, I suppose). There is no loss of "forgiveness" as a result. The three iron is not to be feared. I don't find it noticeably more difficult to hit than the 4-6 irons. I no longer carry a hybrid. I like these better than the I5/I10 irons. If you want a great Ping, that won't break the bank, try a set.